Even after having camped in this area for years now (since 1983), I still find something new and exciting to explore in this rugged out of the way, historic gold-mining area. Walhalla has seen boom, bust, fire and flood, yet here it stands today, providing tourism enjoyment to many travellers. 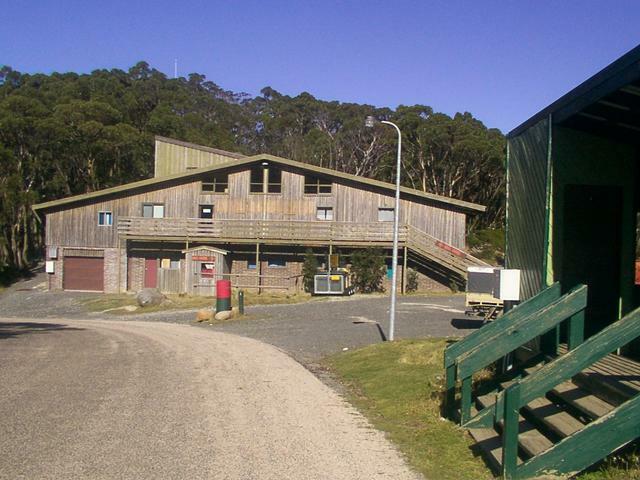 Rawson, Erica and Walhalla offer accomodation options that permit the traveller to stay for an extended time in the area, and the loop trip is a nice deviation from the long trip up along the Prince's Highway. A good starting point if you're coming out of Melbourne, is the 2hr drive along the Prince's Freeway to Moe where you take a left exit into the town. 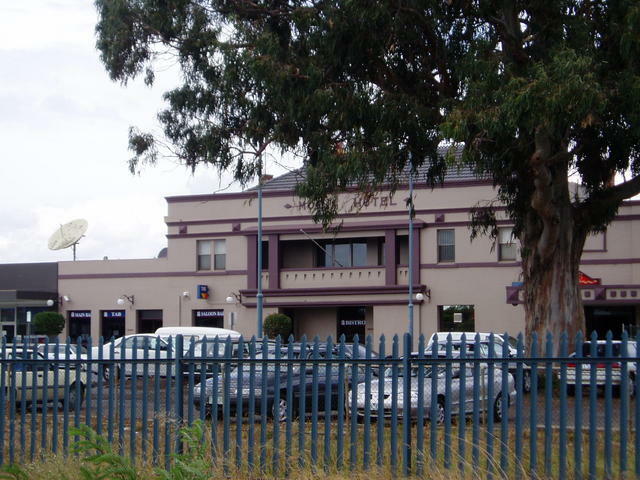 Moe offers a fine horse racing track and associated function facilities in the town. And from there, you're only 30 minutes drive up into the foothills towards Parker's Corner junction. So saddle up your camping/walking gear or book into some local accomodation, and get ready to explore som e great local history! And of course: there's a few great local taverns in the area to quench the thirst! Introduction: What are Pub Trails? First stop: Moe, for some fuel. The garage at Erica has long closed, and the general store in Rawson re-opened the local pumps in their town in 2007 - but it may not be every day trading. So don't get cuaght with a low tank before heading off towards the northern sections of this itinerary. From the Melbourne entry to Moe on the Prince's highway, follow the road in along and over the railway line where you'll come to the Moe Racecourse. The town lies ahead of you, but the hotel was on the original side of the railway you've just crossed. The roads leading to Erica, Rawson, Walhalla and the Thomson Dam, are easiest reached by taking a left turn past the racecourse, and heading down the eastern fence of racecourse. This is the heavy truck vehicle bipass of the town, but access for parking in the town is conveniently on your right, if you want to stop for supplies. But pushing on the detour road, and taking a left at the T-intersection at the end, brings you onto the road that will take you north. Good fuel supplies can be had as you leave this northern end of Moe. 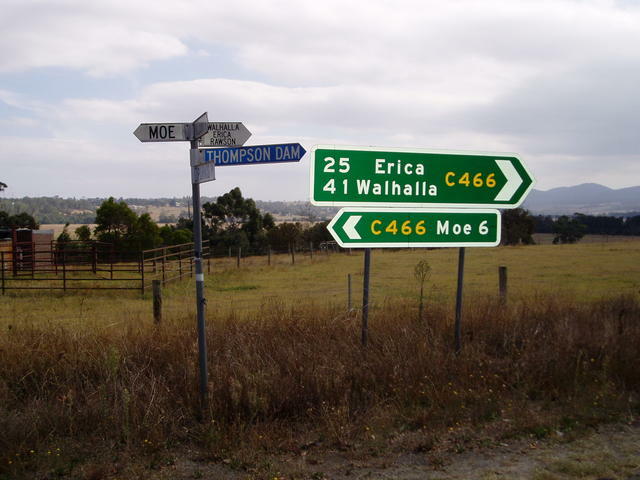 Exiting Moe, take the left turn at the roundabout maked: C466 (Willow Grove) (Walhalla) Thomson Dam. Heading on out of Moe, up north on the road to Thomson Dam via Erica, Parker's Corner and the roads that ultimately lead you over to Walhalla via Rawson. 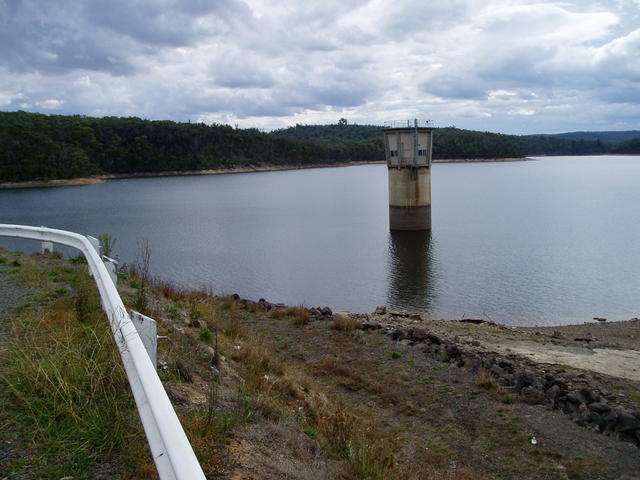 A short distance out of Moe, on the road to Erica, you'll come to a turnoff on your right for the Moondarra Reservoir. It's only a few kilometres in and out, on sealed road. The township of Gould was once located here, before the area was flooded for the building of the Reservoir. Of the buildings saved, was the Cecil Inn, relocated and nicely restored, and in the picnic grounds of the Reservoir for community use. Take a drive down below the picnic ground, and out to the spillway wall which you can drive onto for a good look around. Erica has long been a timber mill town, up until its closure in 2008. The local General Store caters for most needs of the traveller. The Erica Hotel boasts a huge collection of saws, axes, chainsaws and machinery related to the timber cutting industry. well worth a visit, and chat with the local publican: Mark. Have a chat about the equipment he has on display - there's some real heavy old chainsaws from the 40's and 50's - you really wonder how men worked with them! Mark is also very active with trailbike and offroad motorcycling groups who stage events regularly in the area, and has helped raise significant funds for charity for the Royal Children's Hospital with such events. 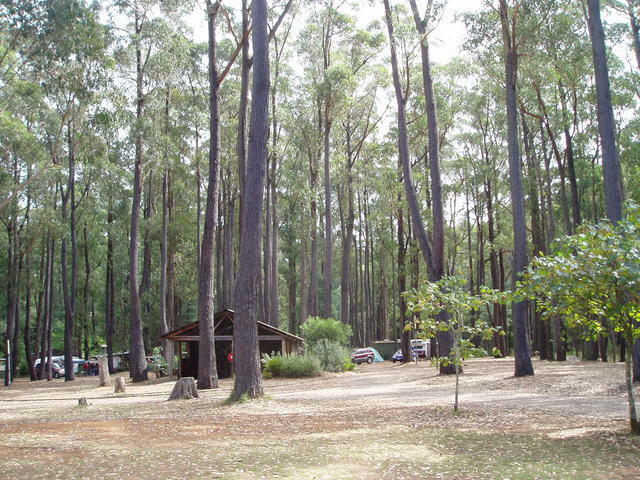 West of Erica is a large scouting camp (8kms) and the area is ideal for staging camp for exploring the near by Mt Baw Baw area and its South Face. 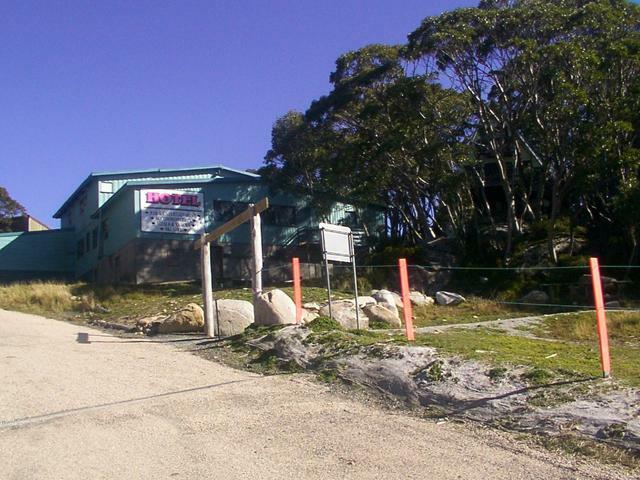 In 2008, a new road (South Face Road) will allow skiing enthusiasts to travel to Mt Baw Baw up from Moe thru Erica, to reach the Ski Resort village of Mt Baw Baw. This will be a significant improvement on the original winding road that comes up from Tanjil Bren on the other side. Take a stroll around the town, and out to where the original railway once came up through from Knots Landing to Erica - whilst the rail is log gone, its a great walking area east of the township. There is a well graded exit road (McLelland Rd) from Erica that can lead you east, across to the Walhalla Tyers Rd for access to Walhalla Rd to Walhalla from here. Or you can drive further north up towards the Thomson Dam, out of Erica, and take a right turn about 4kms up, at Parkers Corner. That road will take you through Rawson, which can then lead you down to the same Walhalla Rd entry point. A superb collection in the Bushman's Museum located in the main dining room of The Erica Hotel of forestry and timer industry machinery and pubobilia! 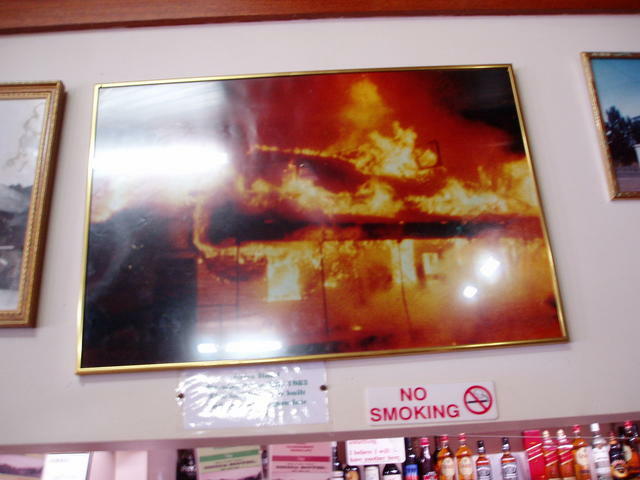 The place really fires up around the dining room fire - even moreso with the warm hearted contributions made for events like Red Cross after events like the Erica Enduro motorcycle events. Always on the go! Heading up from Erica, you reach Parkers Corner (4kms), where you can turn off right to Rawson towship and head on over to Walhalla. 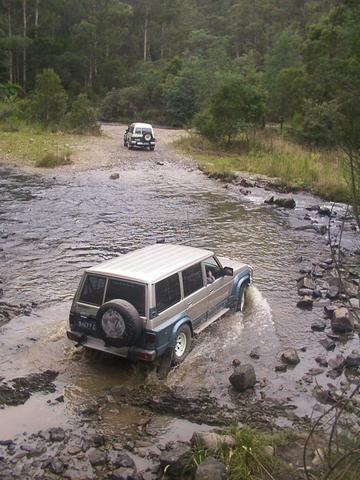 But heading straight on further north (20mins), will take you all the way to the end of the Bitumen at the Thomson Dam. You'll start to see glimpses of the dam wall as you start to descend. 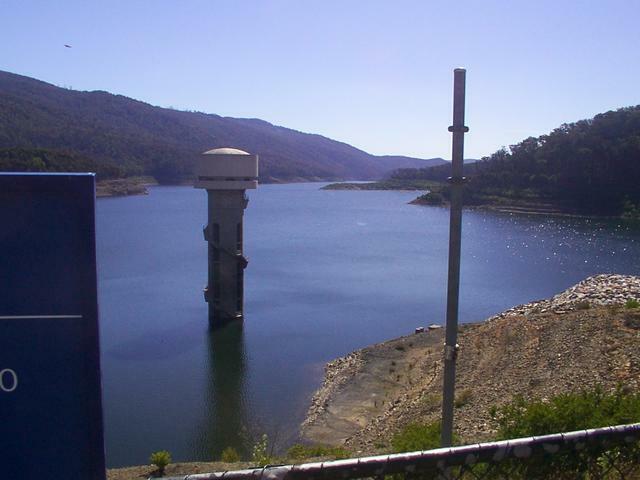 On the way down, you'll find a LEFT turn into a great picnic area that has excellent BBQ and Toilet facilities, with views of the dam, and small walks that lead you close to the southern end of the dam. 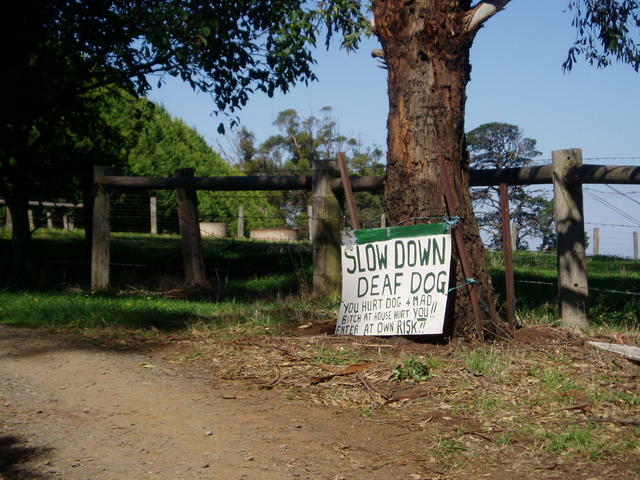 The South Face road can take you all the way up to Mt Baw Baw resort. (Turn off about 2kms past Parkers Corner, at Amor). The Mt St. Gwinear area is a good deviation to do a little cross-country walking. A good map of the new Southface Rd is available from the local Walhalla and Mountain Rivers Tourism Association website which has a map. Travellers should note, that whilst the Southface road is unsealed, it is in great condition, from Amor's turnoff through to the Mt Baw Baw entrance. Of course there is still the alternative sealed route available by slipping back almost to Moe, and taking the run up through Willow Grove to Icy Creek that way. 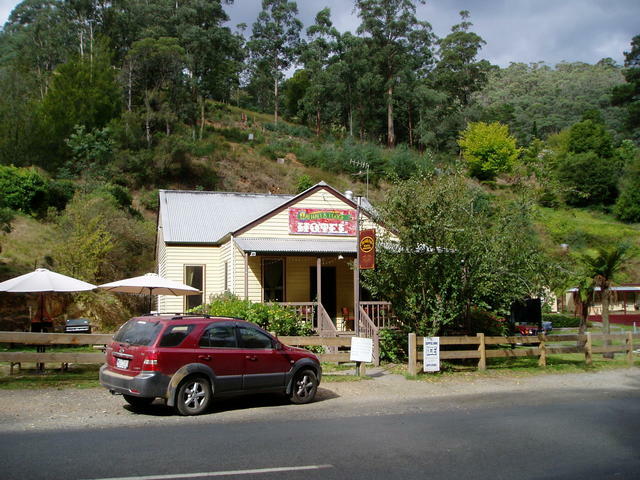 We highly recommend considering a separate Warburton Pub trail run from this area, out through Noojee to Yarra Junction as an alternative to reaching the Melbourne eastern suburbs area. 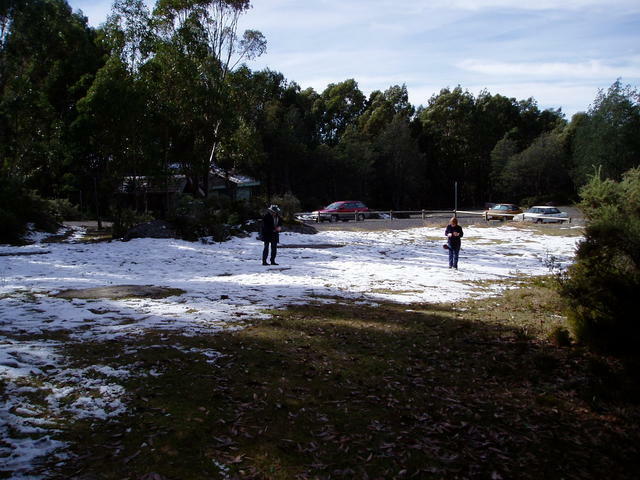 Mt St Gwinear lower carpark - yep: Snow in April Easter! Grab some snowballs and start throwing! 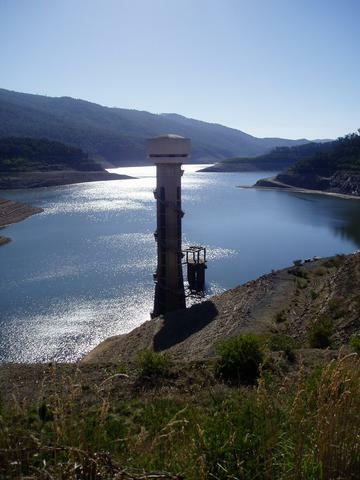 The township of Rawson was built, to house the workers for the duration of the Thomson Dam's construction, and part of the town, is now a brilliant caravan park and holiday resort, with many residents living there as well. The construction workers were transported up to the dam site each day from various accomodation that was built in the town. The former hotel is now a conference facility for groups that like to spend a few days to focus on their projects. 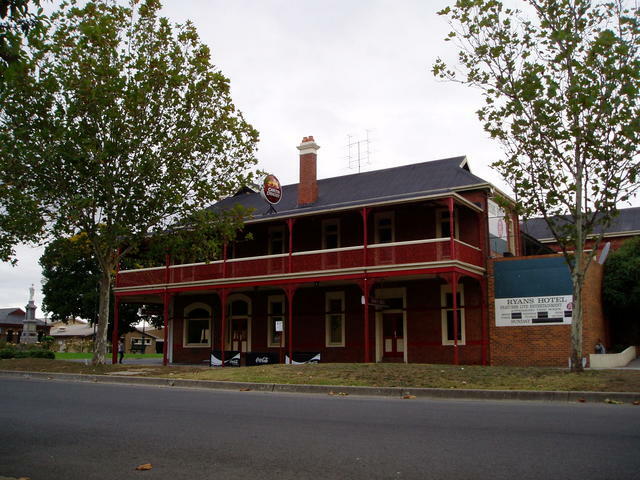 The local licenced hotel is now the Stockyard Bar and Bistro, that is located within the Rawson Caravan Park itself, just down Depot Rd which branches off at the Oval at the top end of town. 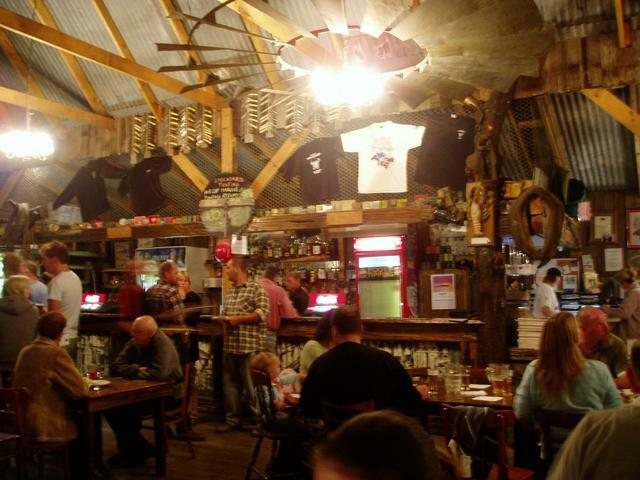 The Stockyard is a truly different Tavern experience - a top spot for parking the rig and meeting up with fellow travellers. It has great atmosphere with its huge open fire, and pubobilia spread all throughout. There's also a big outside area undercover. 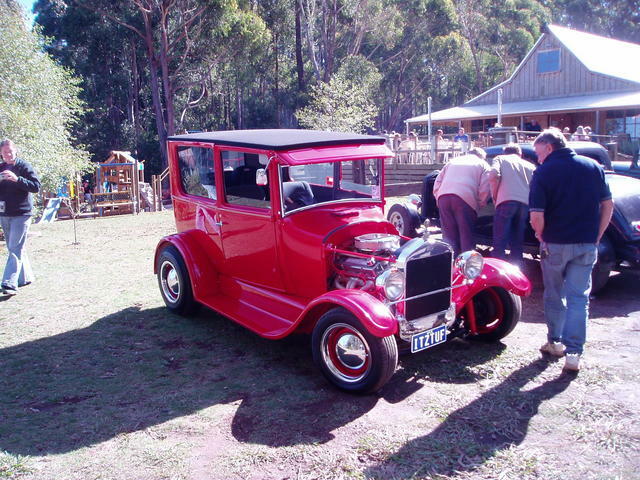 With so many accomodation options right onsite, it is a top place for organising car rallies and tours, and is ideally positioned for access to the Dam, Mt Baw Baw and Walhalla. Everything's fired up and humming at the Stockyard Tavern! Great food, top live entertainment and great selection of ales, sprits and wines! AND: Right in the local camping park! 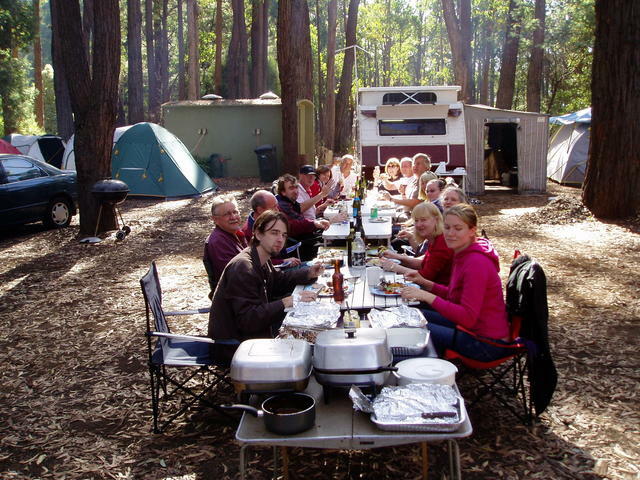 Enjoying the company and the outdoor atmosphere of camping! On the road from Rawson/Erica over to Walhalla, you come to a steep turnoff south, to Coopers Creek. The road is well graded, but very thin, and not recommended for caravans, although a number of small ones get down there for Easter every year - more likely access from the other end. But access from the Walhalla Rd end, brings you first to a small bridge that traverses the original Moe to Wlahalla railway line (now a walking track at this point). 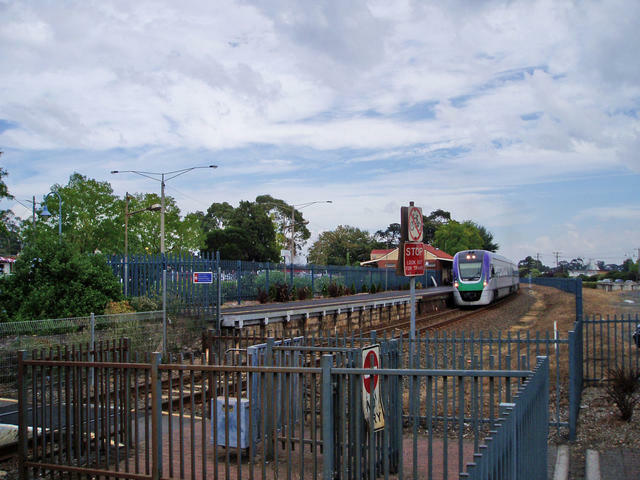 This point was once the Platina Station, and the railway embankment of the station is still there. 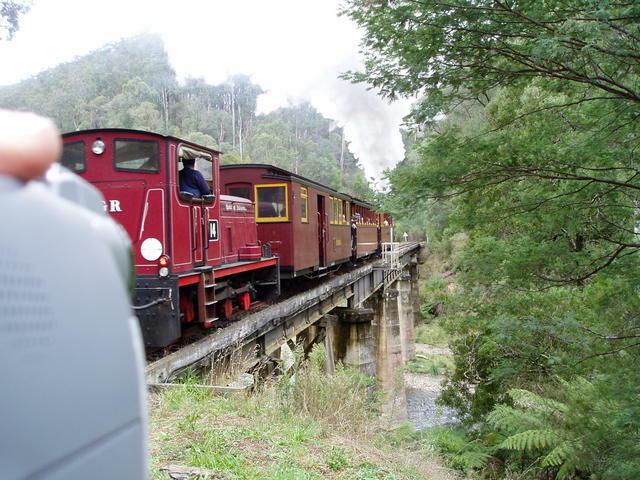 You can walk along the track from this point all the way down to the Thomson River where the Walhalla Goldfield railway narrow guage track has been fully restored. Pushing on down (5 mins) south to Coopers Creek there is a camping area on the left in a looped road area, which gives access for serious 4WD enthusiasts who want to cross the river to reach the Coopers Creek Track and Old Walhalla Coach Rd on the far side. Taking the right fork, you come to the meticulously restored Copper Mine Hotel and adjacent private residence of the owner. The remains of the original Hotel, and its chimneys have been retained in the rebuilding of this fine old Hotel, which is open for special functions by appointment. Respect the privacy of the residents in this area when travelling past. Keep the dust down! 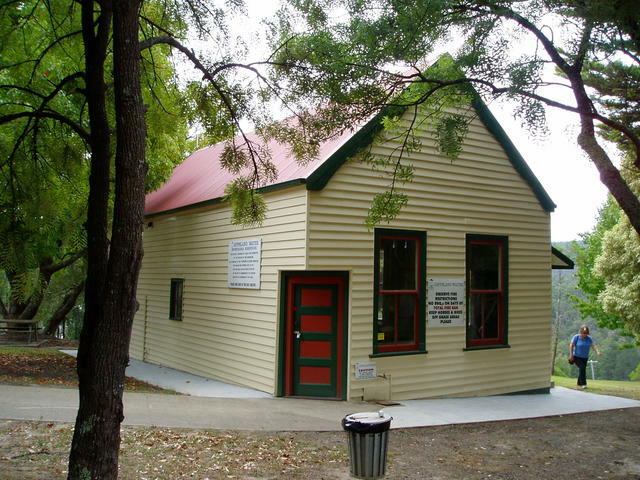 Coopers Creek provides a seasonal river crossing point over the Thomson River to join up to the Walhalla-Brunton's Bridge historical track that links Moe to Walhalla. 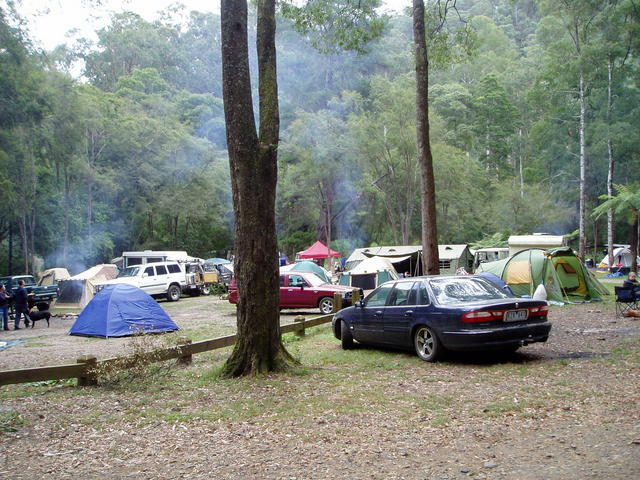 More lucky campers staking their ground for a tremendous Easter break at Cooper's Creek riverside camping area. 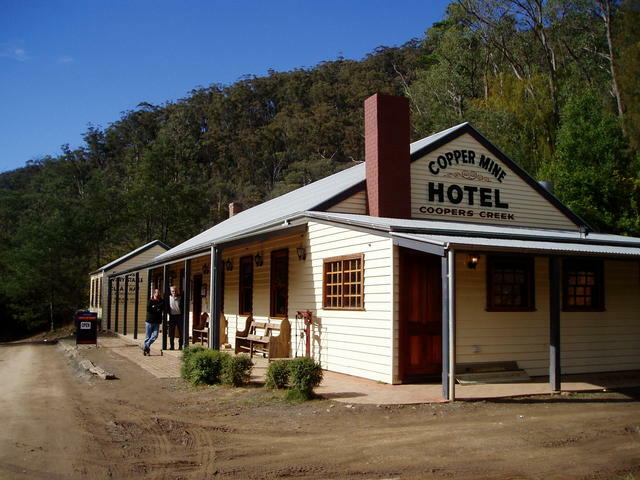 No its not the pub with no beer - it's the lovingly rebuilt Copper Mine Hotel that opens for special events by appointment in Cooper's Creek - but always worth a drive down to see! 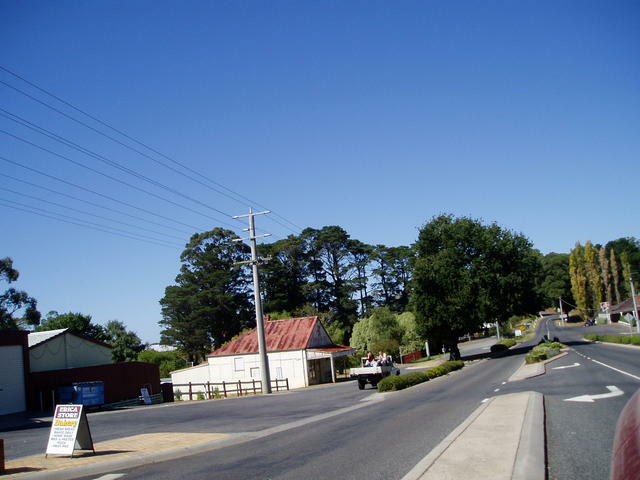 The central focus of the area, of course, is the township of Walhalla itself. It was the last town in Victoria to get power connected when there were only 13 residents in town, the railway was first completed just after the town went into decline, and it has been savaged by fires and floods - yet here it stands, a magnificent attraction with plenty of interesting things to see. 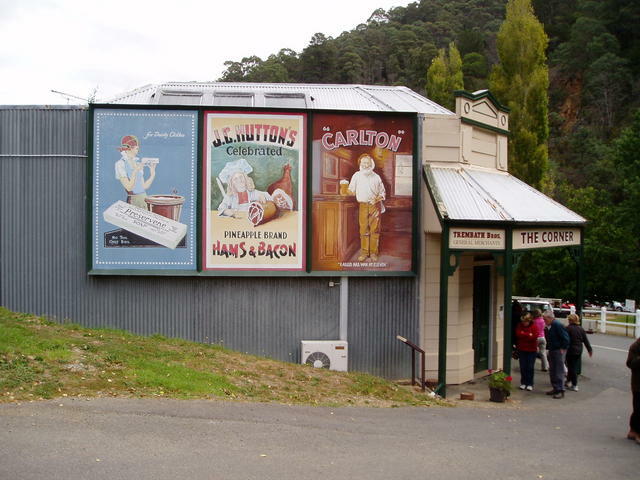 Walhalla's fortunes came from gold mining, and a tour of the Long Tunnel extended Mine is a well worthwhile tour to see, to get a feel for the history of the town. 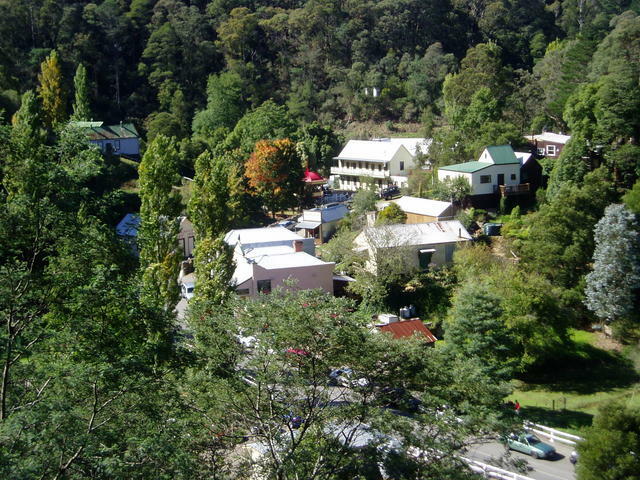 Whilst 2008 marks the centenary of the first cars every arriving at Walhalla, but the history of the town goes way back to 1862 with the first discovery of gold. Some great books havebeen written about the town - my favourite is "Walhalla Heyday" and is a recommended purchase from any of the local tourism operators in the area. Travelling into Walhalla, up from Moe, and say back to Traralgon is easier these days via fully sealed roads (caravans too). 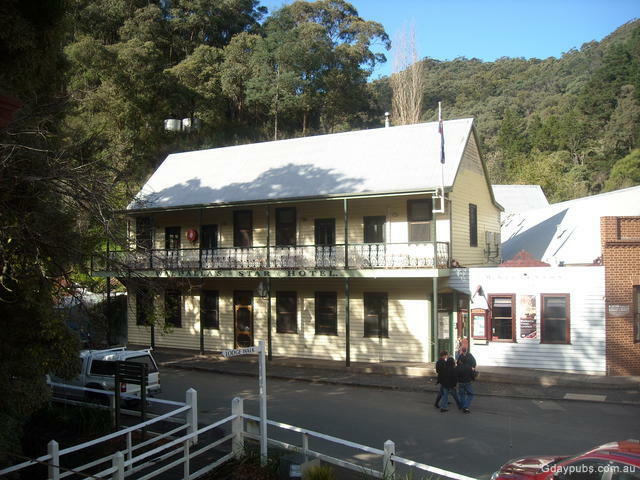 So, drop into the remaining licenced Walhalla Lodge Hotel in town, enjoy a fine meal and pickup some of the history first hand from the local publicans Deb or Bob at the "Wally Pub" not far from the entrance to the town, past the railway station. and if you're really fit and keen, try the 45min hike straight up the mountain to the Cricket Pitch - just to say you've done it! 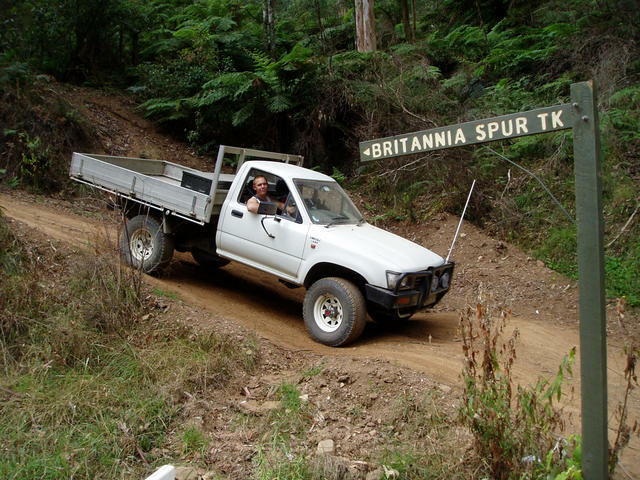 Check out the local tour operators for information on 4WD tours, Ghost Tours or enjoy a self-guided tour of the town...... It's a treat! No matter how you try to reach the Walhalla cricket pitch - its a a hard slog! The walking track is even tougher! 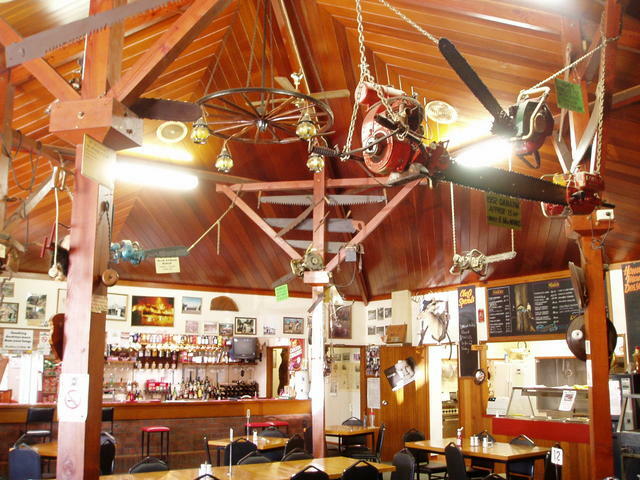 The locals know where to find a good drop at the Walhalla Lodge Hotel! And they serve a top meal for the exploring traveller! 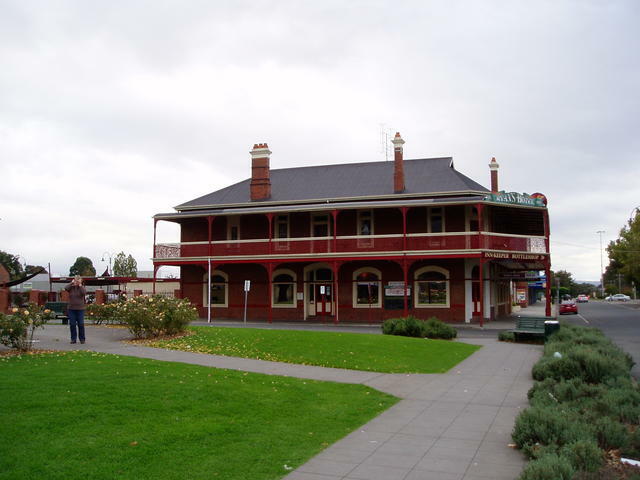 Traralgon is a great central place to make a base for exploring a number of tourist areas, so wrap up the Walhalla trip by exiting down into Traralgon area. (If you're doing the Walhalla trip coming in from the NSW side of Prince's Hwy, then run the Walhalla itinerary we've outlined here, in reverse, ending back up in Moe, if you prefer. 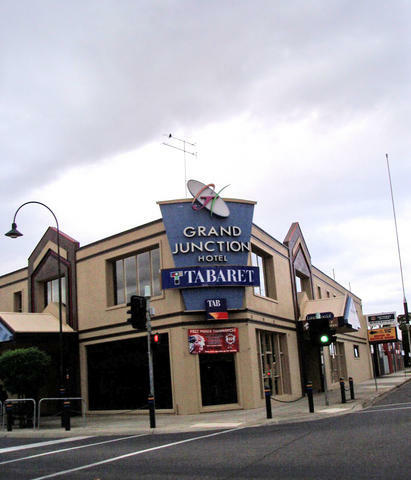 Traralgon, is quite a large city, and offers everything you would expect in the way of shopping, clubs, services and tourism information. One of the main streets of the town (Franklin St and Kay St corner) has some significant Post Office building which is an architectural masterpiece - worth visiting. And nearby is Ryan's Hotel with an enormous and beautifully restored main bar. And check out the original Ostler's house that is part of their beer garden! Head east, opposite the old Post Office into Post Office Place to the foot of town, on the Prince's Hwy, where you'll find magnificent gardens. 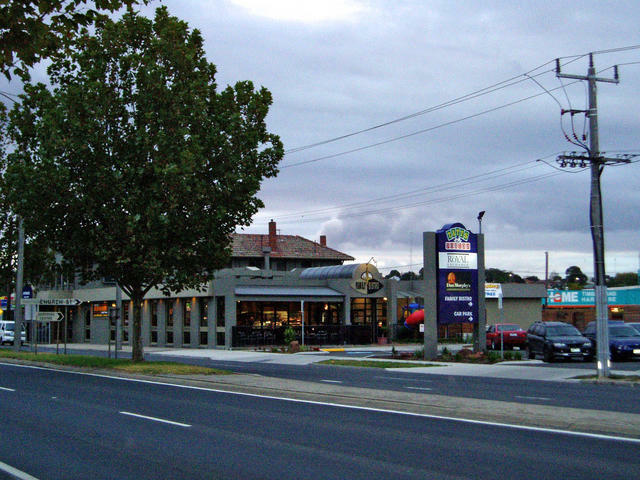 One block south of the gardens is Whittaker's Rd, and worth noting, as this is an ideal exit to head down to Mirboo North - just one of the many day trips we outline in the Central Gippsland Pub trail. 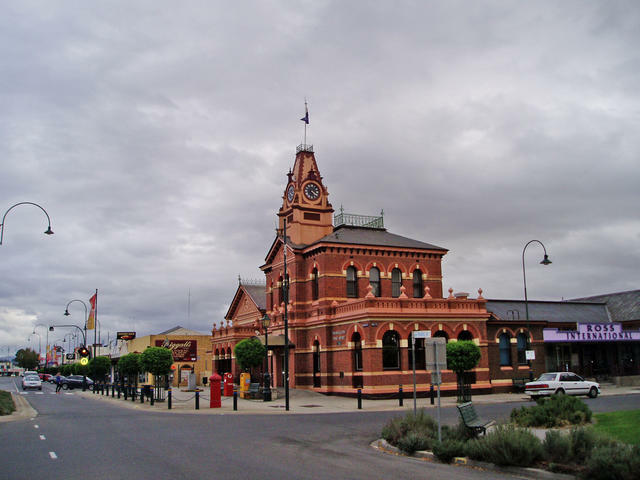 Traralgon is a good base for exploring the Power Plants that provide all the electricity for Victoria, and also a good town for doing a day trip south into the Tarra-Bulga National Park. 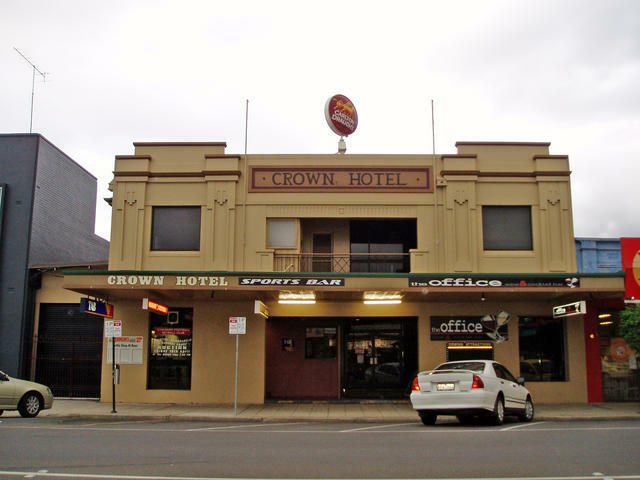 So sit back and enjoy some hospitality from the locals in Traralgon, and plan the next trip! Situated on the main Prince's Highway. The beautifully presented Ryan's Hotel - possibly boasting one of the longest main bars in the country!